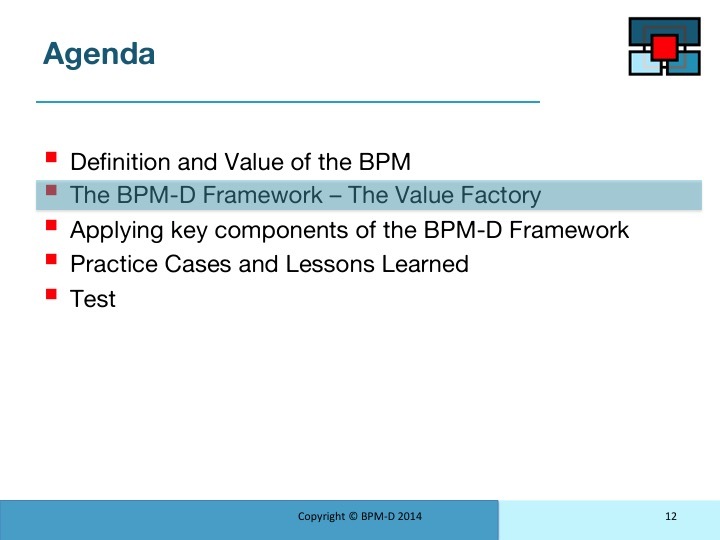 This section briefly describes the major components of the BPM-Discipline Framework. 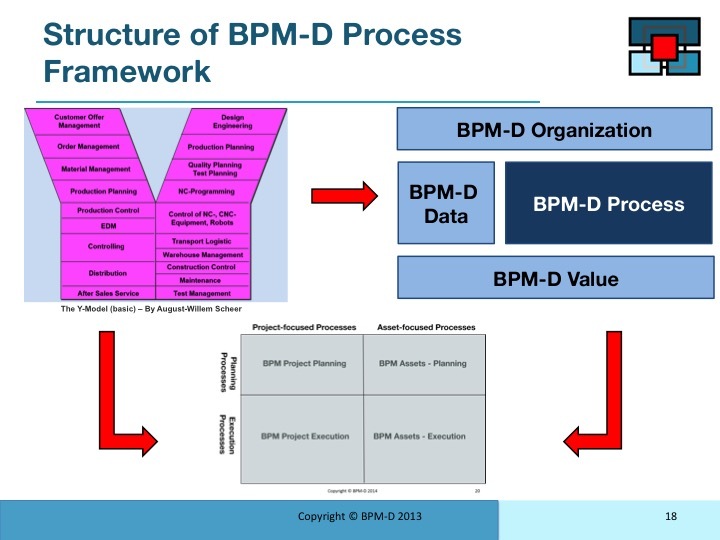 As outlined in the previous section the BPM-D framework is a (patent pending) outline of the elements of an effective process management discipline. 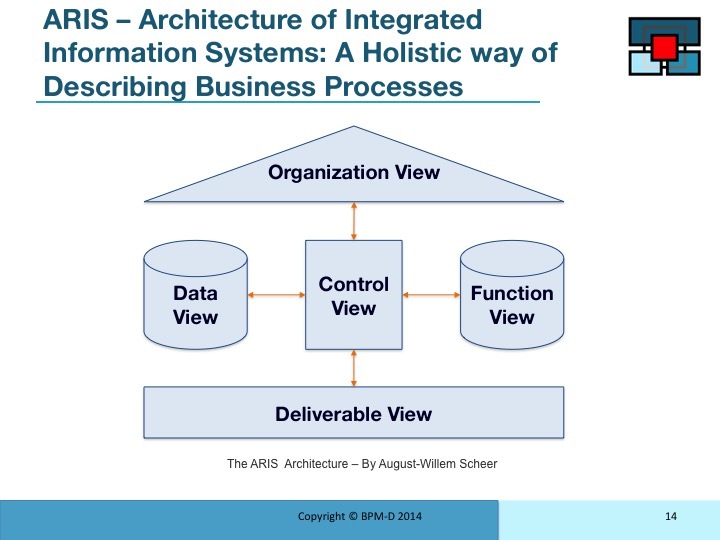 As shown in the ARIS model, a good process should be described holistically including the five dimensions shown in the model. 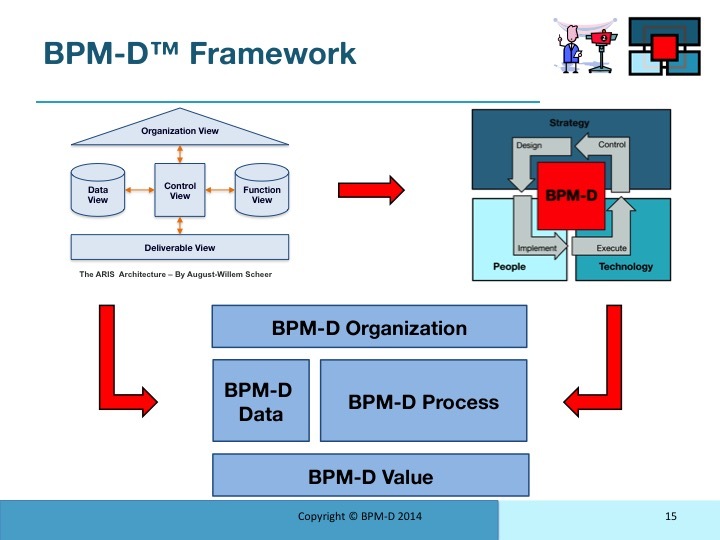 Applying the ARIS architecture to the process of process management, the BPM-D Framework has been established to describe all the dimensions of the BPM-Discipline. 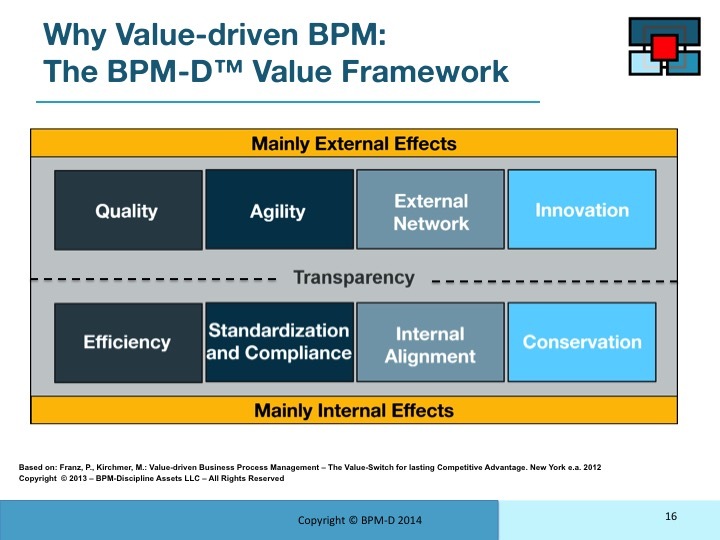 The first component of the framework is the focus on value. This was described by Mathias in some detail in the first Topic . 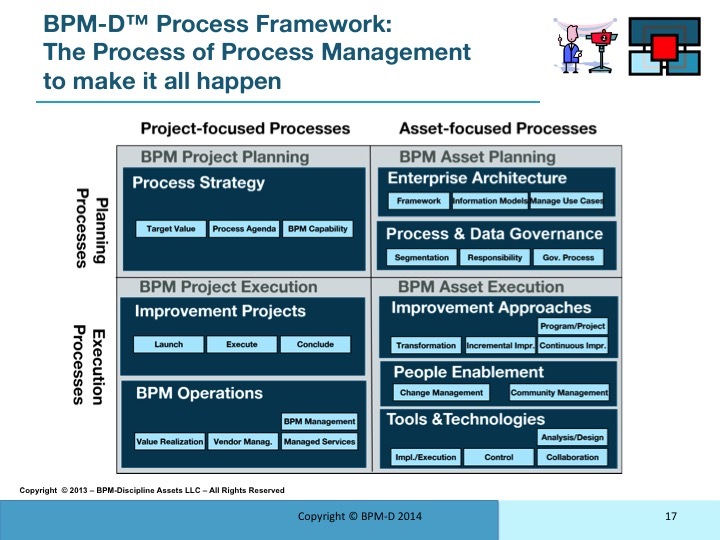 These are the major sub processes you would expect to find in a complete process of process management. This is described in more detail on the following pages. In structuring the process framework the scheer y-model has been applied as shown on the next chart. 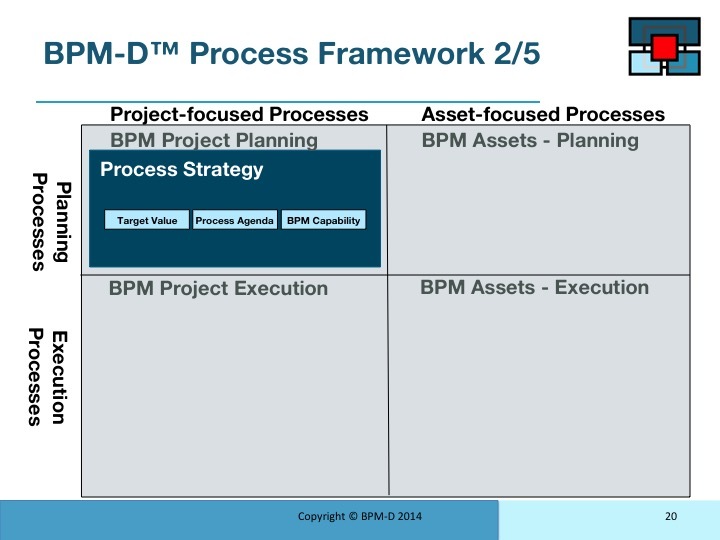 Using the y-model we split the processes into a 2 by 2 matrix. 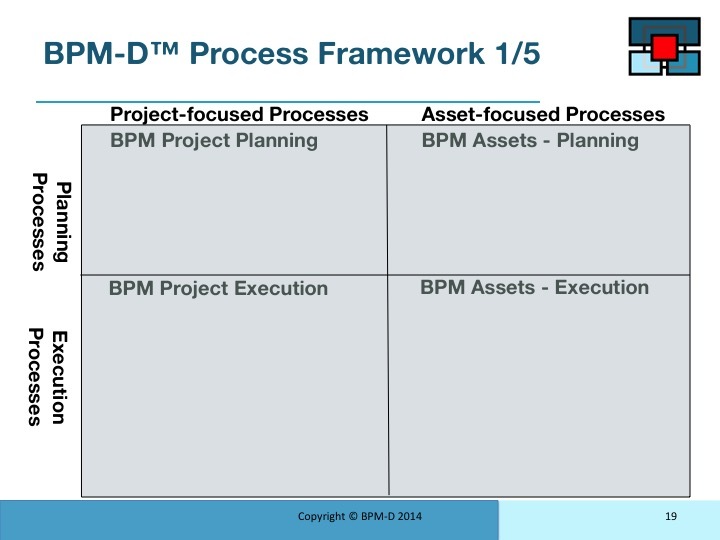 On the horizontal differentiating between Asset focused (building things) processes and Project focused (doing things) processes. Vertically we distinguish between planning and executing. 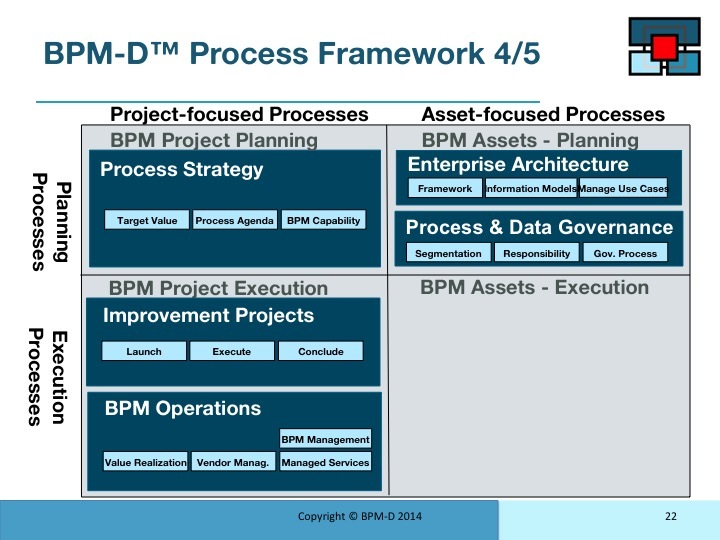 The starting point of value driven BPM-D targets value and then establishes a BPM agenda while building BPM capability. 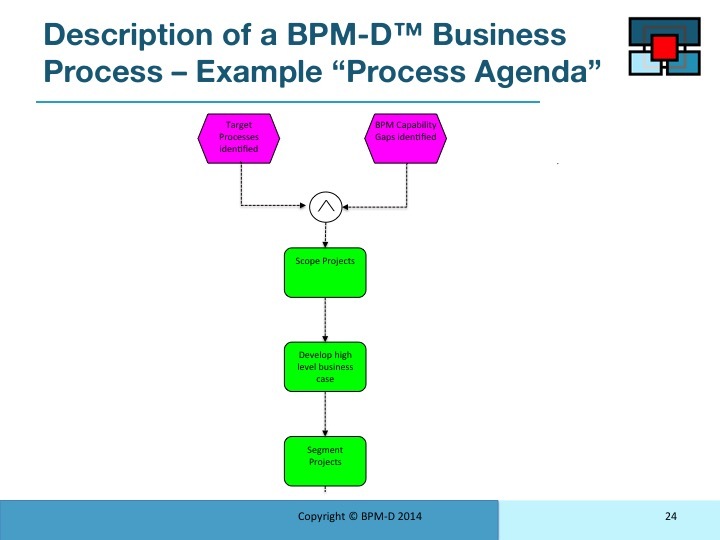 This set of processes focuses on understanding the use cases for BPM information stretching this into usefull information models.Process governance is the key to understanding and also has responsibility for maintaining and using which processes. 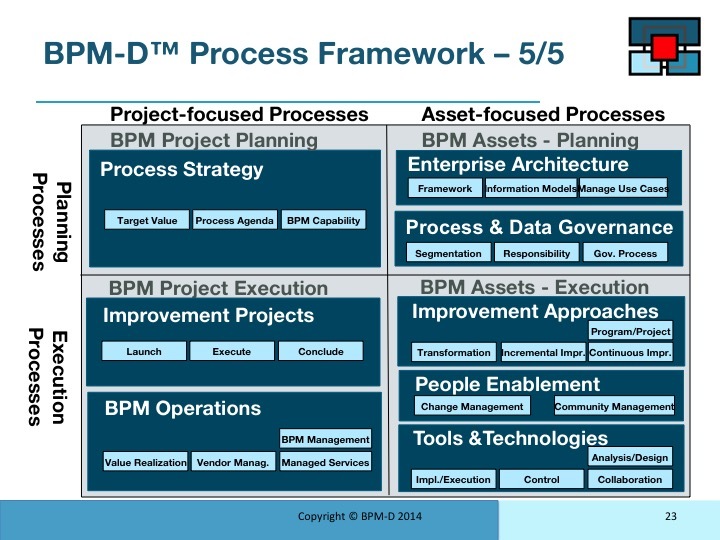 Here you have the processes that manage the methods and tools that enable BPM execution through people and technologies. 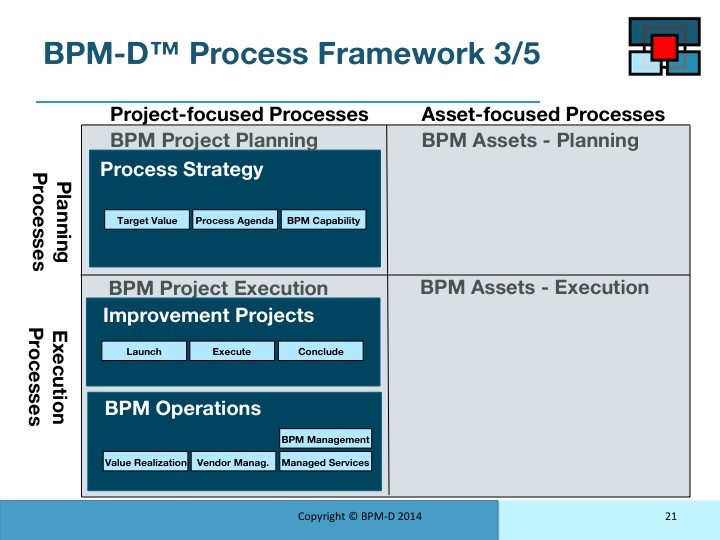 For each of the process we then drill down into more detailed process descriptions and flows. This is a very basic example. 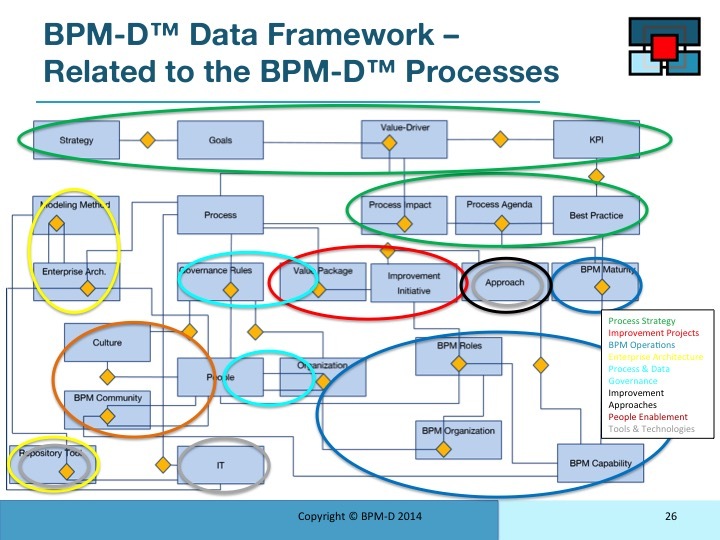 Behind these processes an integrated data model is required to effectively provide the information required to manage a BPM capacity. 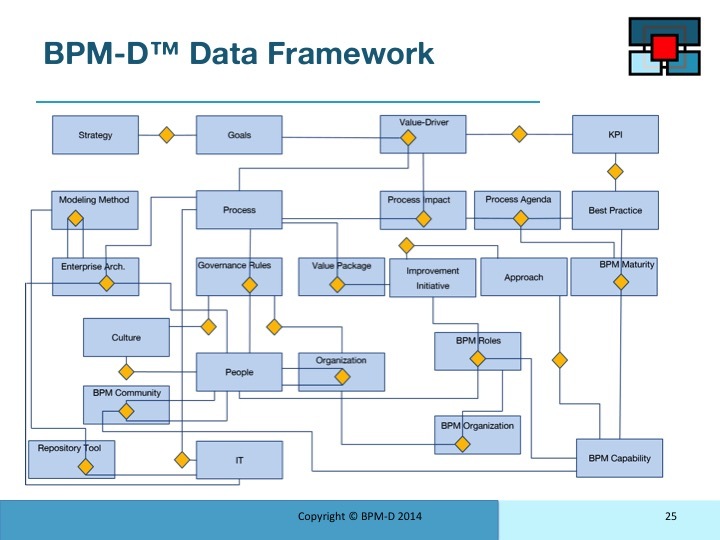 Each of these groups of data can be mapped to the process areas as shown. 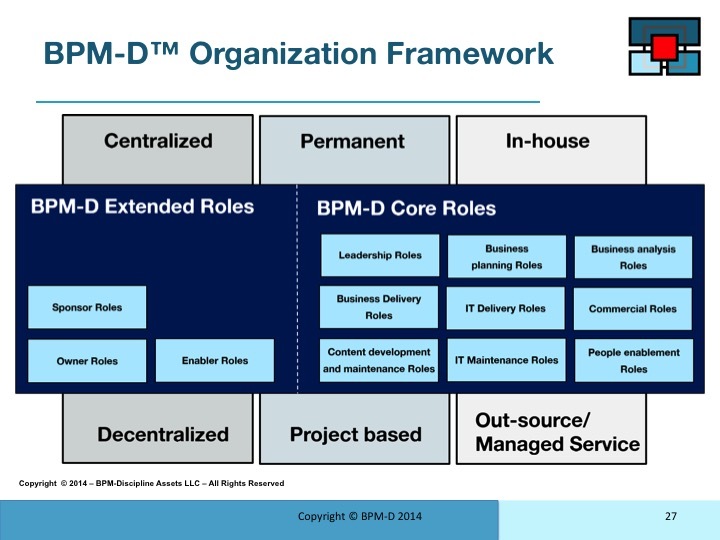 People across the organisation and in partnering organisations execute process management in the major roles identified on the chart. 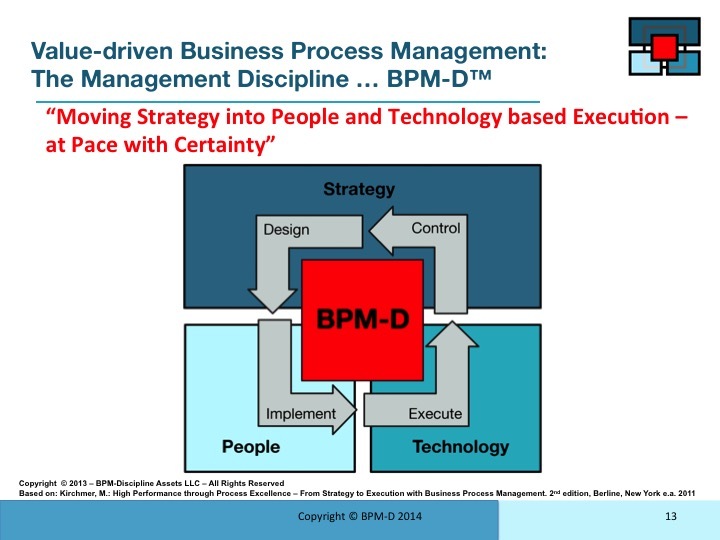 Collectively the right people executing the right processes with integrated information and the right tools deliver the promise of Value-Driven BPM.